CPUT staff never miss an opportunity for their students to learn and network with industry partners. The massive construction taking place at the Bellville campus, where the new engineering building is being built, is the perfect training ground for a number of courses on offer at the institution. 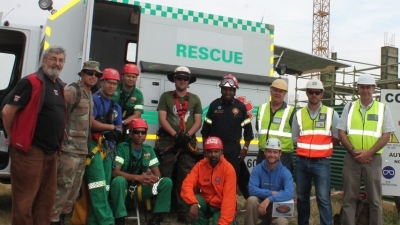 A 43 metre crane on site created the perfect chance for Emergency Medical Care staff and students to practice their rescue training. COMMON PRACTICE: Volunteers from various rescue units used a construction site on campus for an invaluable rescue simulation. The invitation was also opened up to industry partners like the military health services, airport fire rescue, metro rescue and the fire department. Lecturer Schalk van der Merwe thanked the construction company Stefanutti Stocks for their willingness to allow the rescue simulation to happen on site. “We simulated the crane operator having a heart attack up there as well as an electrical accident. The purpose of the simulation is to keep our rescue training abilities in top form,” he says. Despite a slight drizzle volunteers from the various units took it in turns to ascend the crane then descend using ropes. Justin Ventzke from Stefanutti Stocks says the construction site has been attracting students from a number of courses like quantity surveying. “A few have come to ask for work shadowing opportunities and we have been happy to oblige,” he says.